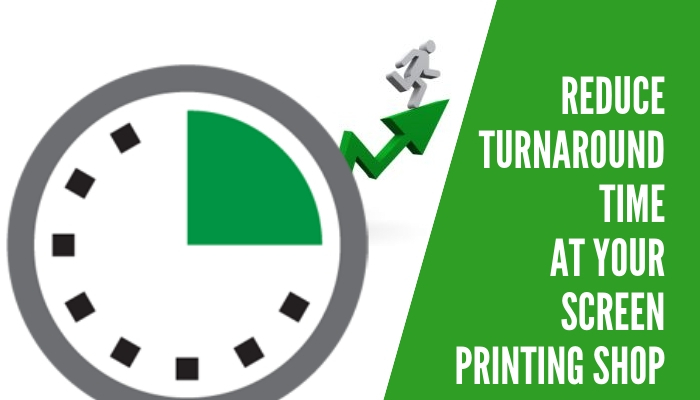 You Are Here:inkXE Blog Web to Print How to Reduce the Turnaround Time at Your Screen Printing Shop? Probably the best way to impress your new customers is by producing orders faster without sacrificing quality. It will surely keep your customers happy and keep them returning for more business. Reducing turnaround time is a great way to keep your business distinct from the competition. And because you are in a screen printing business, you have to be high time sensitive. For example, if a customer needs a shirt urgently, could be for an upcoming event, the faster you can get it done, the more likely that the same customers will choose you in the future. But, at the same time, you have to be careful not to cut corners. Because it may lead to mistakes which will seriously upset your customers and hurt your shop’s reputation. Here are our top tips to help you produce orders faster, yet maintaining high-quality prints. While building work orders for a screen printing job, you need to ensure that the information you have is correct and complete, before being produced. If you have to, double check each work order and ensure that you have all the details you need to complete the job. It is much better to step back and fill in missing information than to waste your valuable time later, which can cost you your effort, time and money. Sometimes, your order can get challenging. Which brings us to the importance of keeping detailed records of your jobs. If need to record the machine parameters, supplies, techniques used and other details you employed to complete your job. This will give you a library of experience to refer to from time to time. As you complete a challenging job, you will be able to execute it much easier in the future if you have kept a detailed record of the job. Most print shops overlook the need for arranging their floor plan efficiently. If workers have to retrace their steps or cross their path multiple times during the production workflow, you can be certain that your floor plan is not efficient. Simply by sketching the path of your workers over the process of a print run will reveal ways to make it better. This way you will be able to run orders faster without wasting much time. It can be tempting to take more orders even if you know you are jam-packed with other orders. This is not the right attitude for print shops. You need to be honest with yourself about your capabilities and limits. Don’t take more than you can bite, and don’t make promises to your customers you know you can’t keep. You could start by keeping a record of the time it took to complete your previous orders, which will help you gauge how fast you can turn orders around. It will also help you identify areas where you can improve. In order for print shops to survive in this fast-paced world, businesses need to prioritize their work instead of simply producing jobs in the order they are received. If you can prioritize them, you can make the most of your time. Prioritizing work will enable you to fulfil each order faster and thereby making your customers happy. However, you have to make sure that you don’t skimp on the quality of the prints. Here are some questions you could ask yourself the determine which print job goes first. Are there any print jobs for which deadlines are more flexible than others? You need to take care of the orders with hard-and-fast deadlines first even if they are not the first one to come. This way you will be able to cater to all jobs. Are there any special orders that demand special supplies? If some orders need special supplies, you could move them down in priority and address jobs that you can execute using the current inventory. Gauge the order quantity and the number of professionals required to produce the job. If you are shorthanded don’t tackle big orders first as they can set you back. This way you come up with a viable plan. What machine or equipment are you using to produce your order? If you have a manual printing press, use it to get small orders. On the other hand, use an automatic printing press to handle big orders. This will save you a ton of time and effort. If you think your shop’s work process is getting out of your hands, you could employ a shop management software to automate your business process. It will help you stay organized and also eliminate wasting of time. Keeping work orders and job statuses at one place will enable you to stay on schedule and avoid unnecessary confusion.